Summary: Friday’s parents are busy scientists, so she’s been on her own for most of her childhood. A curious and intelligent child, she’s taught herself more in eleven years than most people learn in a lifetime. After she cracks a bank robbery case, she decides to use the reward money to pay for a year at the exclusive Highcrest Academy. 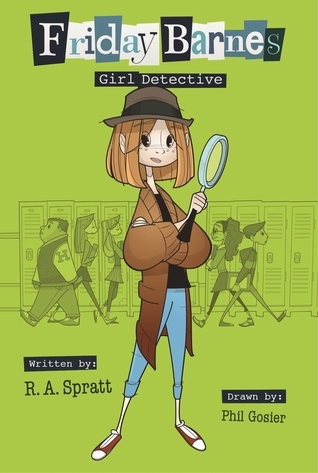 Her plans to blend in fail miserably, and she soon finds herself in demand as a private investigator, solving everything from missing homework to the identity of the big hairy monster in the swamp behind the school. The book ends with her unexpected arrest; readers will have to wait until the sequel comes out in August to learn what that’s all about. 272 pages; grades 4-6. Pros: This Australian import features offbeat humor, a quirky but spunky protagonist, and a colorful cast of supporting characters, illuminated with plenty of cartoon-type illustrations. I’m not always a big fan of “quirky”, but this was done in a way that kept me chuckling until the end. Cons: This might not work for a mystery book report, as it is a series of small mysteries rather than one big one.